It’s almost impossible for Illinois taxpayers to know if they are paying a fair price when it comes to goods and services provided by the state-government workforce. In the private sector, productivity is the sum of all goods and services (as measured by Gross Domestic Product) divided by the number of workers. But in the public sector, there is no reliable measure of the “goods and services” received because prices are not set on a voluntary basis. Rather, citizens pay taxes that are deemed necessary to fund government at a level determined by elected officials. This study provides a better understanding of the productivity of Illinois’ public sector by examining state-government compensation, including wage and salary and benefit levels across the 50 states. The basis of this comparison is to examine payrolls in Illinois versus the national average. Since the national average represents an amalgam of 50 states and is the equilibrium level between government productivity and pay, this can be used as a benchmark from which to determine if any one state is more or less productive by observing the deviancy away from the national average. With this relative metric, high pay is not associated with greater productivity, since it is shown that other governments achieve the same performance with lower pay. Being above the national average indicates “low productivity” among the government’s workforce and vice versa. This analysis found that Illinois’ operating deficit, which has led to more than $5 billion in outstanding bills, would not exist if, since 2000, state government had simply paid its employees at a rate relative to what other state governments pay their workers. 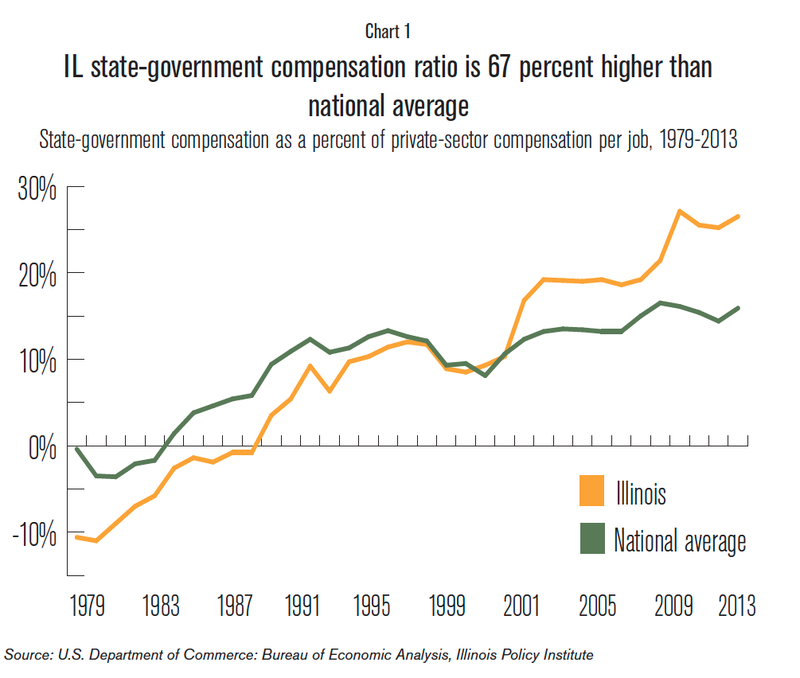 The first part of the study examines compensation levels in Illinois state government. In calendar year 2013, the average Illinois state-government compensation was $82,314 per job, while the average Illinois private-sector compensation was $65,064 per job. In other words, the average Illinois state-government job paid 27 percent higher than the average Illinois private-sector job. This is significantly above the national average of state-government jobs, which compensate 16 percent more than private-sector jobs. While wages and salaries and benefits contribute to high state-government compensation levels, this study will dive deeper on wages and salaries because they also contribute to high benefits levels – pensions, for instance, are based on an employee’s earnings. There are many reasons why, nationally, state-government compensation exceeds the private sector, including differences in educational levels, and some have tried to use this as a rationale for the imbalance between state government and private pay scales. 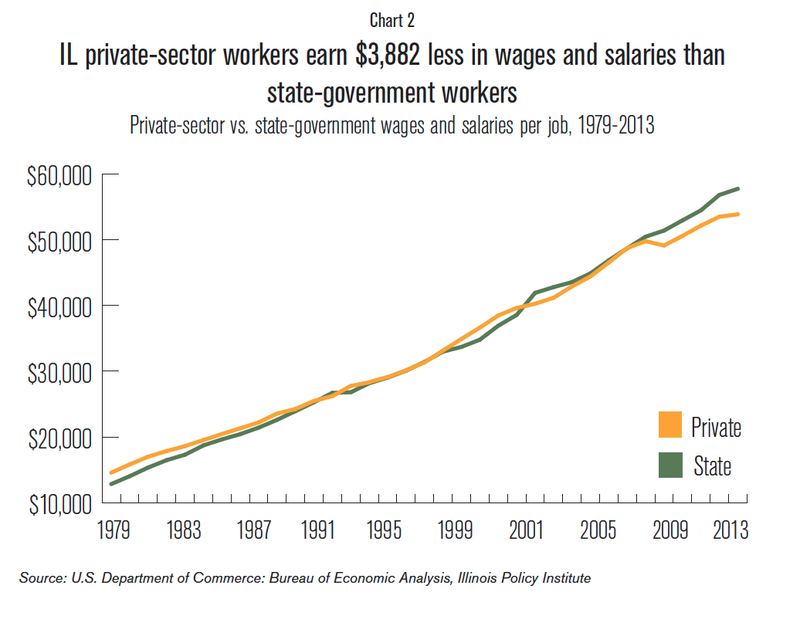 However, studies that control for such variables still find that Illinois state-government workers are richly compensated.1 This study is not affected by this issue, because in addition to a direct private vs. public comparison, it offers a correction of Illinois’ state-government wages-and-salary ratio to the national average of state-government pay compared to private-sector pay. The second part of the study will examine Illinois state wages and salaries by 32 government functions, such as administration, corrections, highways, public welfare and higher education, among others. This detailed information will provide policymakers with a map to aid in the effort to right-size the payrolls of the state-government workforce. Overall, adjusting Illinois government wage-and-salary ratios to the national average in calendar year 2013 would have saved taxpayers up to nearly $1 billion across all funds. However, payroll savings to the general funds are more limited because some positions are paid for through dedicated state funds, such as the gas tax to fund highways, or by the federal government, such as unemployment insurance. As such, payroll savings to the general funds in fiscal year 2015 are estimated to be up to $780 million if fully adjusted to the national ratio of state-government wages and salaries divided by private-sector earnings. To put this into perspective, these payroll savings are enough to eliminate the estate tax and insurance premium tax – a combined $668 million in fiscal year 2013. Alternatively, adjusting average Illinois state-government wages and salaries to equal the average Illinois private-sector wages and salaries would yield general funds payroll savings of up to $443 million in fiscal year 2015. To put this into perspective, these payroll savings are enough to eliminate all occupational and business licensing ($431 million in fiscal year 2013). According to the U.S. Department of Commerce’s Bureau of Economic Analysis, in calendar year 2013, Illinois paid state-government employees $12.5 billion in total compensation (wages and salaries plus benefits), or 3.8 percent of nonfarm private earnings. This includes payroll from all funding sources, be it from the general funds, dedicated funds or federal funds and allows for apples-to-apples comparisons across the states. Policymakers need relative metrics to judge whether Illinois state-government employees are paid too much. The “compensation ratio” offers that perspective. The compensation ratio is derived by dividing state-government compensation per job by private-sector compensation per job. In calendar year 2013, Illinois state-government compensation was $82,314 per job, which is 27 percent higher than the private-sector compensation of $65,064 per job. The compensation ratio is shown in Chart 1. Between calendar years 1979 and 2000, Illinois’ public-sector compensation was generally below the national average. However, since 2000, state-government compensation not only exceeds private-sector compensation, but also the national average compensation ratio. In calendar year 2013, Illinois’ state compensation ratio ranked as the 10th highest in the country, and higher than the national average ratio of 16 percent. More specifically, compensation is composed of two components. The first is the wage or salary paid to the employee for services rendered. The second is benefits, which include employer-provided health insurance and retirement. The wage-and-salary ratio is derived by dividing state-government wages and salaries per job by private-sector wages and salaries per job. As shown in Charts 2 and 3, in calendar year 2013, Illinois state-government wages and salaries were $57,790 per job, which is 7 percent higher than the private-sector wages and salaries of $53,909 per job. In calendar year 2013, Illinois’ wage-and-salary ratio ranked as the ninth highest in the country. These data show that Illinois is very much out of step with pay scales in other states. Generally speaking, the old adage that government workers take lower pay in exchange for higher future benefits, such as pensions, is true on a national basis – but not in Illinois. 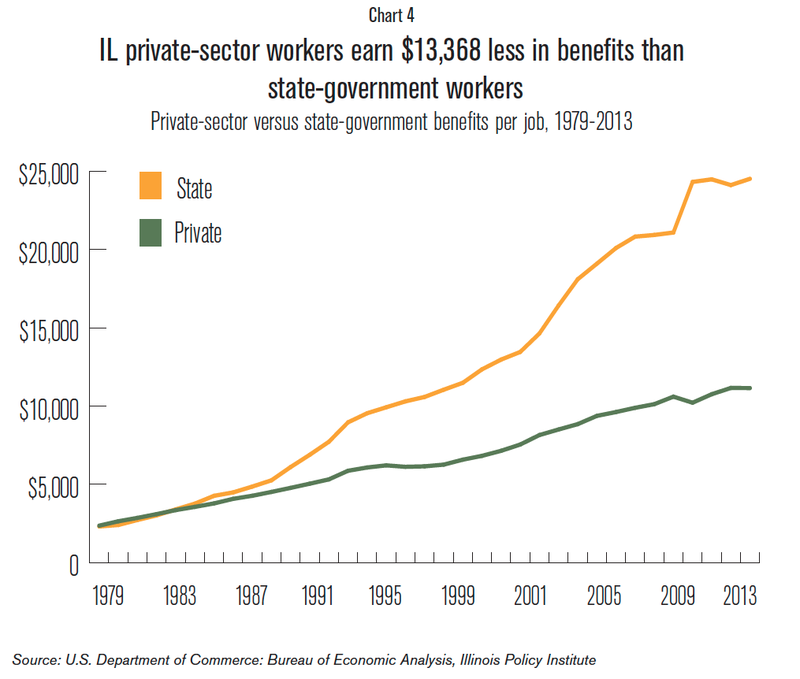 Overwhelming data show that state-government workers in Illinois earn high pay and high benefits. The benefits ratio is derived by dividing state-government benefits per job by private-sector benefits per job. 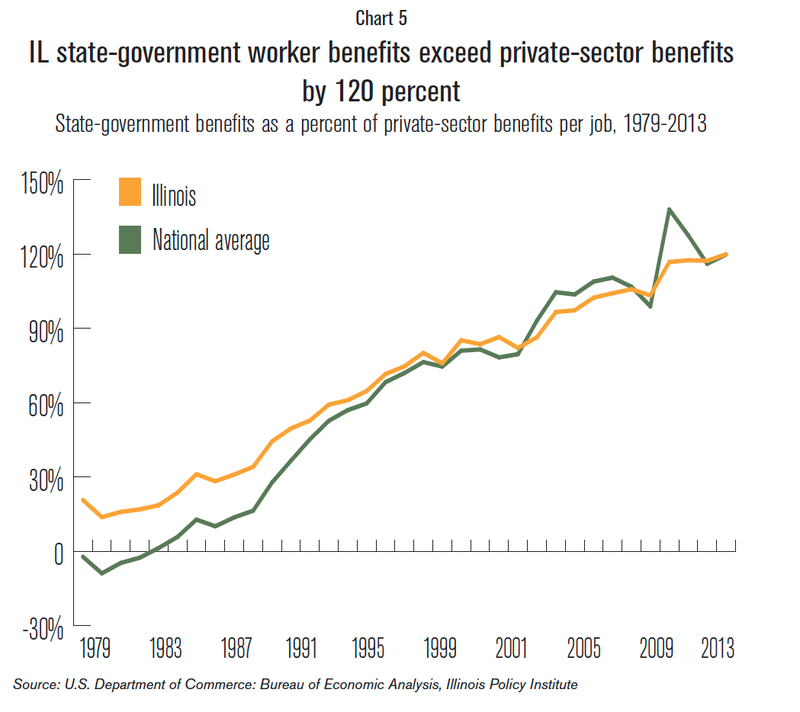 As shown in Charts 4 and 5, in calendar year 2013, Illinois’ state-government benefits were $24,524 per job, which is 120 percent above the private-sector benefits of $11,155 per job. In 2013, Illinois’ benefits ratio ranked as the 18th highest in the country. 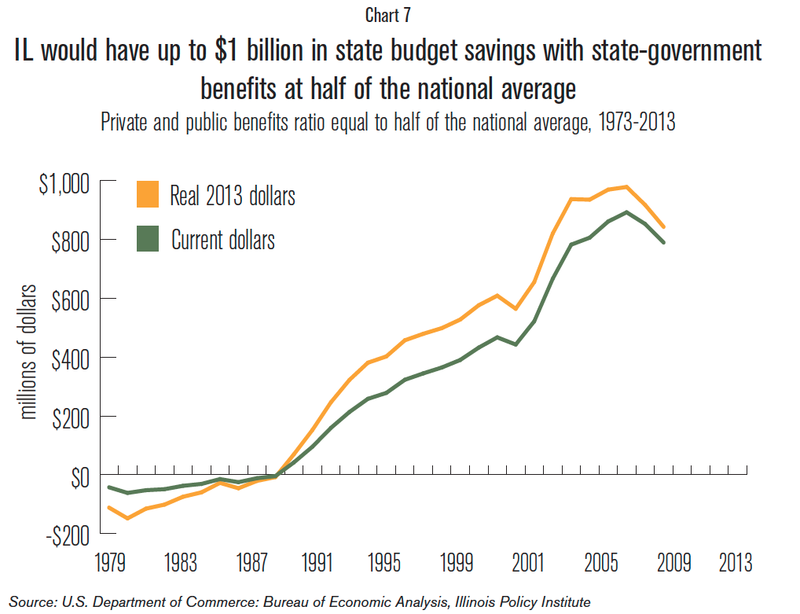 Chart 6 shows how much state-government money could have been saved if the Illinois wage-and-salary ratio was aligned with the national average in each year between calendar year 1979 and 2013. Since 2000, taxpayers would have saved up to $6.7 billion (in nominal dollars). The general funds portion of this is roughly $5.4 billion. Illinois’ operating deficit and past-due bill total would not exist if this money had been allocated to unfunded expenses. In calendar year 2013 alone, adjusting the wage-and-salary ratio to the national average would have saved taxpayers up to nearly $1 billion across all funds. Chart 7 shows how much state-government spending could have been reduced if state workers were to meet taxpayers halfway on the benefits side by cutting the benefit ratio to 60 percent from 120 percent. In calendar year 2013, this adjusted benefits ratio would have saved taxpayers up to $1 billion or more. Reducing wages and salaries would also provide a significant down payment toward achieving the important goal of putting the Illinois pension system on a more sustainable path. 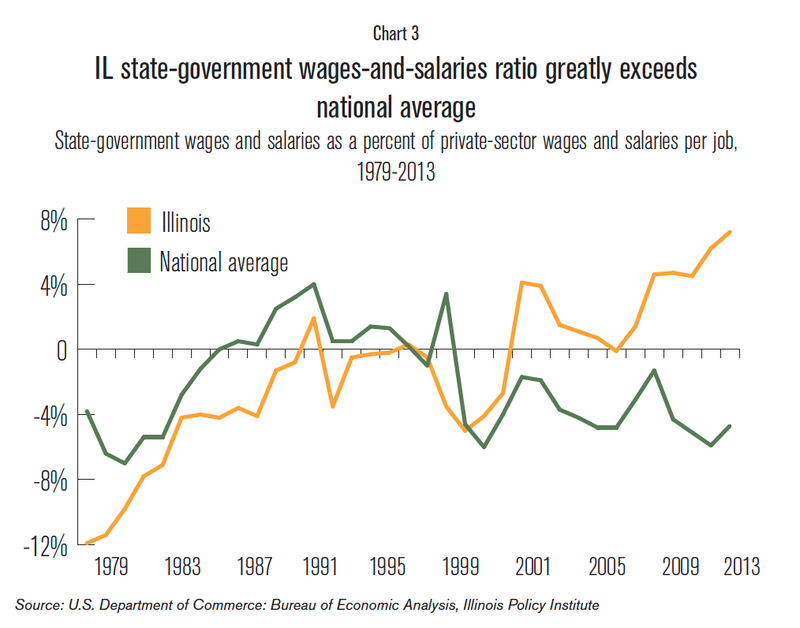 This section of the study will delve deeper into the functions of Illinois state government to better pinpoint the areas where state wages and salaries are most out of line with the private sector relative to the national average. 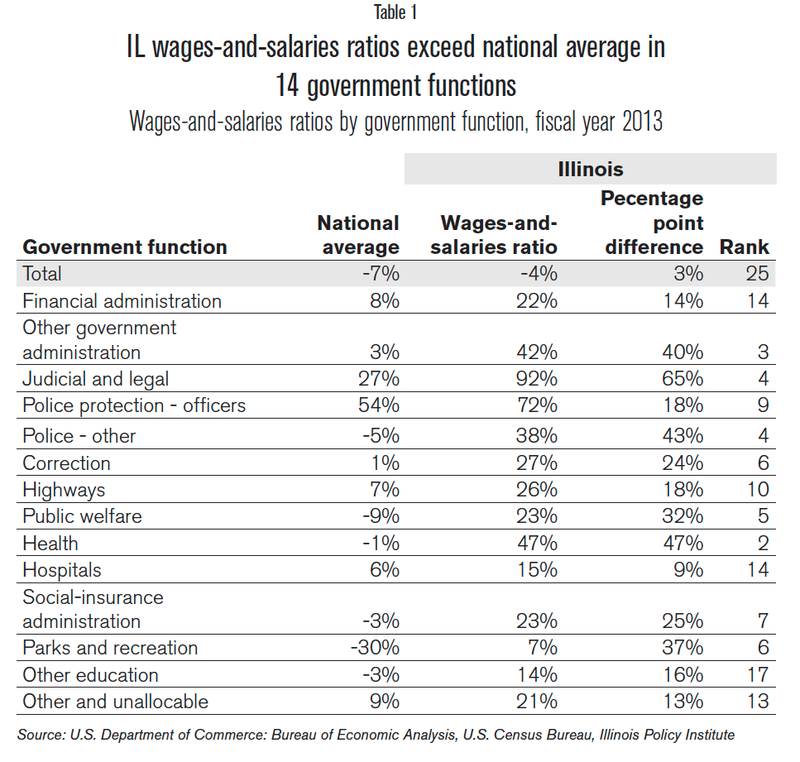 Given the large gap for state government wages and salaries between Illinois and the national average, it is not surprising that this situation exists for 14 government functions, as shown in Table 1 for fiscal year 2013. 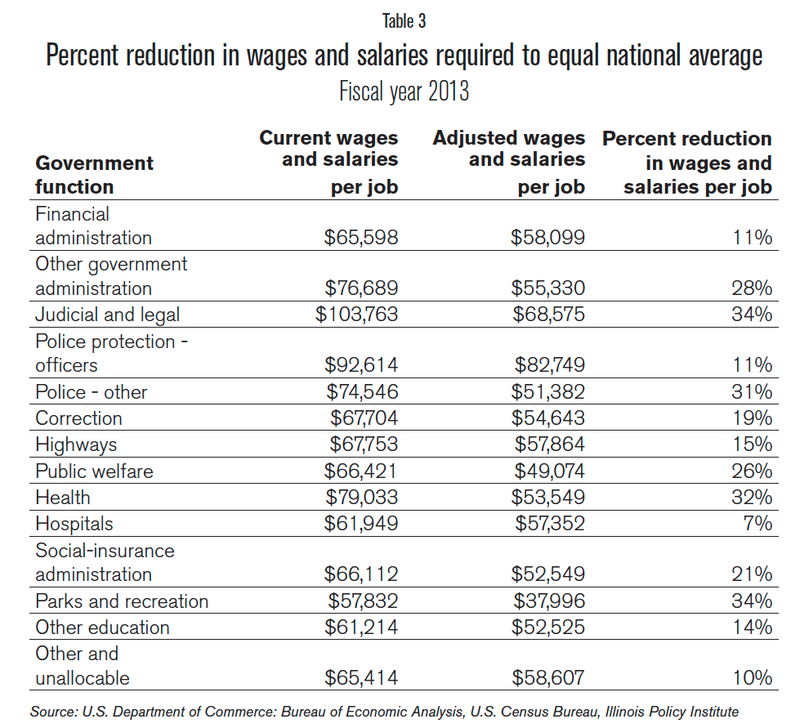 Potential wage-and-salary savings are shown in Table 2 and necessary percent reduction in wages and salaries in Table 3. Financial administration (Illinois ranks 14th highest nationally in this function): Includes officials and central staff agencies concerned with tax assessment and collection, accounting, auditing, budgeting, purchasing, custody of funds and other finance activities. o Lowering the wages-and-salaries ratio of 22 percent to the national average of 8 percent would save up to $46 million or more. This would require a reduction in the average wages and salaries per job of 11 percent to $58,099 from $65,598. 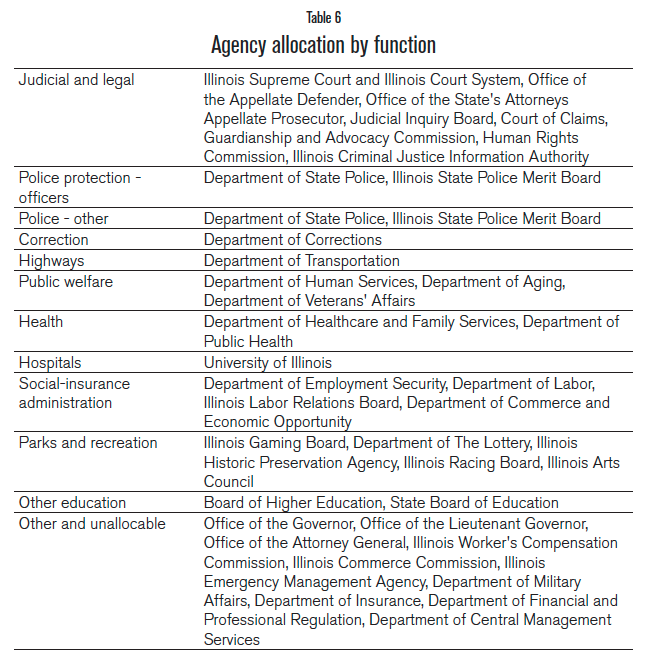 Other government administration (Illinois ranks third highest nationally in this function): Includes administrative functions not included in financial, social insurance, judicial and legal administration. o Lowering the wages-and-salaries ratio of 42 percent to the national average of 3 percent would save up to $54 million or more. This would require a reduction in the average wages and salaries per job of 28 percent to $55,330 from $76,689. Judicial and legal (Illinois ranks fourth highest nationally in this function): Includes courts (criminal and civil) and activities associated with courts, legal services and legal counseling of indigent or other needy persons. o Lowering the wages-and-salaries ratio of 93 percent to the national average of 27 percent would save up to $114 million or more. This would require a reduction in the average wages and salaries per job of 34 percent to $68,575 from $103,763. Police protection/officers (Illinois ranks ninth highest nationally in this function): Includes employees of general police, sheriff, state police and other governmental departments that preserve law and order, protect persons and property from illegal acts, and work to prevent, control, investigate and reduce crime. o Lowering the wages-and-salaries ratio of 72 percent to the national average of 53 percent would save up to $24 million or more. This would require a reduction in the average wages and salaries per job of 11 percent to $82,749 from $92,614. Police/other (Illinois ranks fourth highest nationally in this function): Includes police functions other than for police officers. o Lowering the wages-and-salaries ratio of 38 percent to the national average of -5 percent would save up to $36 million or more. This would require a reduction in the average wages and salaries per job of 31 percent to $51,382 from $74,546. Correction (Illinois ranks sixth highest nationally in this function): Includes all institutional and non-institutional correctional activities. Institutional activities are residential institutions or facilities for the confinement, correction and rehabilitation of convicted adults or juveniles adjudicated delinquent or in need of supervision, and for the detention of adults and juveniles charged with a crime and awaiting trial. Non-institutional correctional activities consist of pardon, probation and parole activities. o Lowering the wages-and-salaries ratio of 26 percent to the national average of 1 percent would save up to $176 million or more. This would require a reduction in the average wages and salaries per job of 19 percent to $54,643 from $67,704. Highways (Illinois ranks 10th highest nationally in this function): Includes the maintenance, operation, repair and construction of highways, streets, roads, alleys, sidewalks, bridges, tunnels, ferry boats and related structures, including those operated on a toll basis. o Lowering the wages-and-salaries ratio of 26 percent to the national average of 7 percent would save up to $92 million or more. This would require a reduction in the average wages and salaries per job of 15 percent to $57,864 from $67,753. Public welfare (Illinois ranks fifth highest nationally in this function): Includes employees engaged in all public welfare activities, including the administration of public assistance and providing direct assistance such as Medicaid and TANF (Temporary Assistance to Needy Families) cash assistance. o Lowering the wages-and-salaries ratio of 23 percent to the national average of -9 percent would save up to $193 million or more. This would require a reduction in the average wages and salaries per job of 26 percent to $49,074 from $66,421. Health (Illinois ranks second highest nationally in this function): Includes provision of services for the conservation and improvement of public health, other than hospital care. o Lowering the wages-and-salaries ratio of 47 percent to the national average of -1 percent would save up to $70 million or more. This would require a reduction in the average wages and salaries per job of 32 percent to $53,549 from $79,033. Hospitals (Illinois ranks 14th highest nationally in this function): Includes hospital facilities providing in-patient medical care and institutions primarily for care and treatment of handicapped (rather than education), which are directly administered by a government, including those operated by public universities. o Lowering the wages-and-salaries ratio of 15 percent to the national average of 6 percent would save up to $57 million or more. This would require a reduction in the average wages and salaries per job of 7 percent to $57,352 from $61,949. Social insurance administration (Illinois ranks seventh highest nationally in this function): Includes administration of unemployment compensation systems. o Lowering the wages-and-salaries ratio of 23 percent to the national average of -3 percent would save up to $31 million or more. This would require a reduction in the average wages and salaries per job of 21 percent to $52,549 from $66,112. Parks and recreation (Illinois ranks sixth highest nationally in this function): Includes provision and support of recreational and cultural-scientific facilities maintained for the benefit of residents and visitors. o Lowering the wages-and-salaries ratio of 7 percent to the national average of -30 percent would save up to $10 million or more. This would require a reduction in the average wages and salaries per job of 34 percent to $37,996 from $57,832. Other education (Illinois ranks 17th highest nationally in this function): Includes employees in support of special programs and institutions primarily for: Training and education (rather than care) of the blind, deaf or other handicapped, programs for adult, vocational or special education that operate outside school systems, educational activities not assignable to other education functions. o Lowering the wages-and-salaries ratio of 14 percent to the national average of -3 percent would save up to $18 million or more. This would require a reduction in the average wages and salaries per job of 14 percent to $52,525 from $61,214. Other and unallocable (Illinois ranks third highest nationally in this function): Includes employees engaged in activities that are not applicable to other employment functions or are multifunctional such as voter registration and elections, economic development and code enforcement. o Lowering the wages-and-salaries ratio of 21 percent to the national average of 9 percent would save up to $52 million or more. This would require a reduction in the average wages and salaries per job of 10 percent to $58,607 from $65,414. 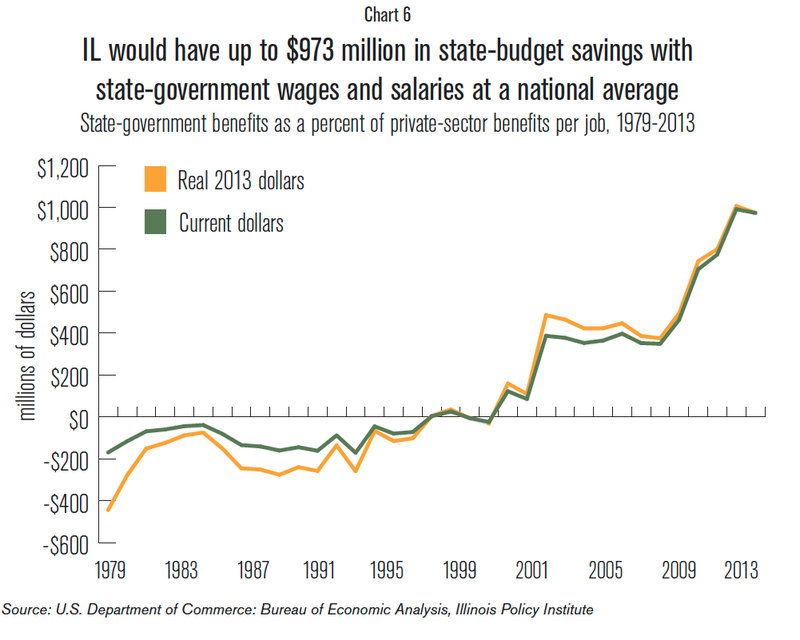 Right-sizing Illinois state-government payrolls along these lines could save up to $1 billion a year. However, not all of the potential wage-and-salary savings will flow to the general funds because some positions are paid for by dedicated state funds, such as the gas tax to fund highways, or by the federal government, such as unemployment insurance. Consequently, as shown in Table 4, the estimated wage-and-salary savings to the general funds for fiscal year 2015 for bringing state government pay in line with other state governments is up to $780 million. 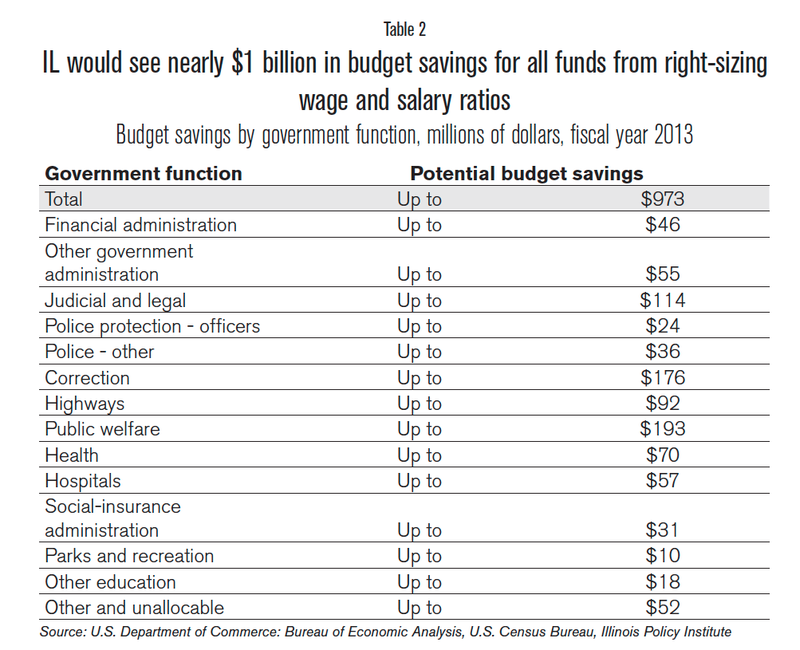 Alternatively, as shown in Table 5, adjusting the average Illinois state-government wages and salaries to equal the average Illinois private-sector wages and salaries would yield general funds payroll savings of up to $443 million in fiscal year 2015. As shown in Chart 3, the gap between state-government wages and salaries and private-sector wages and salaries is growing at an alarming rate. In fact, the pay gap could double (to 14 percent from 7 percent) in just a few years if terms similar to the existing contract persist. The only sure way to prevent the disparity from growing is for the governor to insist on instituting an immediate across-the-board pay freeze for three years. This would create budget savings of approximately $150 million over the three-year period in the general funds based on a projection of the growth in payroll from the previous five years. The expiration of the current state-government labor contract provides opportunities to find real savings for the next fiscal year. 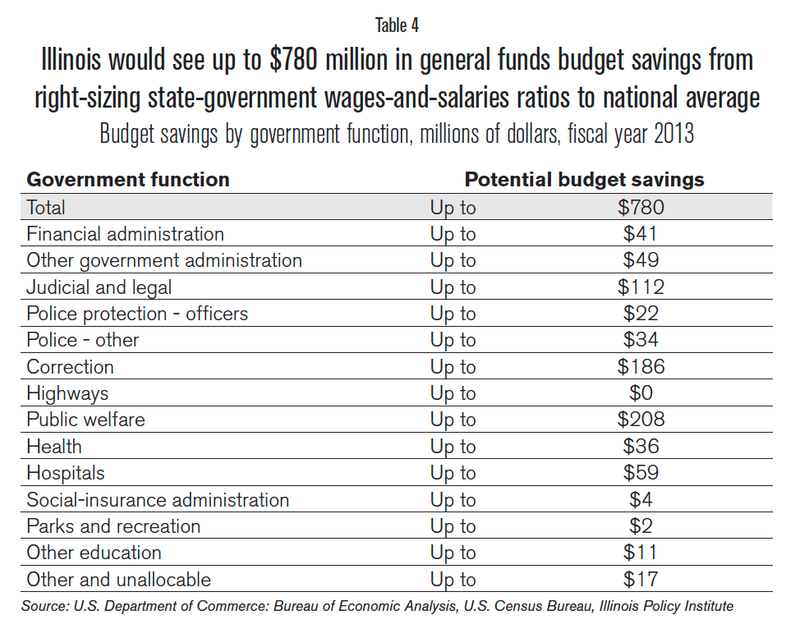 To bring Illinois back to the national wages-and-salaries ratio for state-government workers nationwide and save $780 million would result in a 27 percent across-the-board reduction in general-funds payrolls. 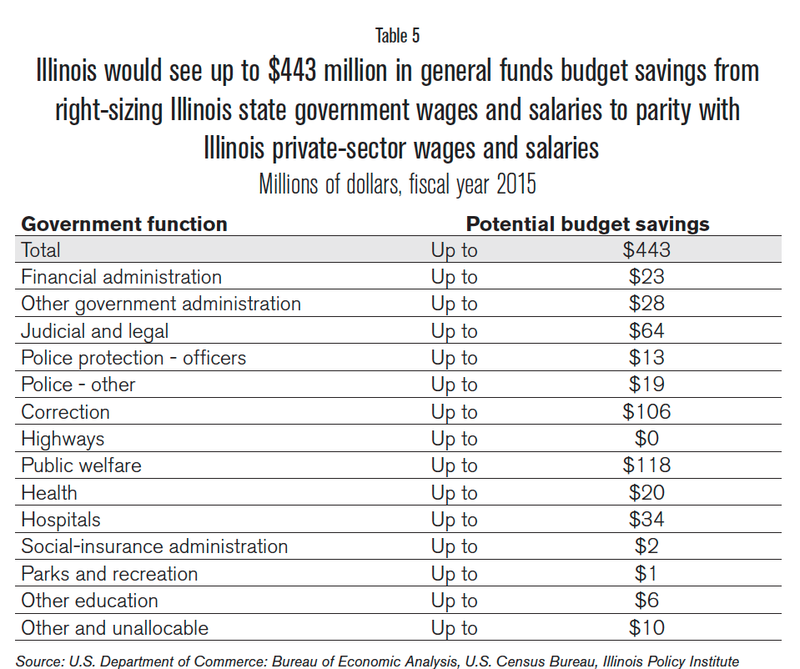 Or, a 15 percent across-the-board reduction in general-funds payrolls could be used to reach parity with the Illinois private sector and save up to $443 million. Additionally, lower wages and salaries will also result in lower benefits, since a significant factor in determining a state employee’s pension is their retiring wage or salary level. Reducing wages and salaries would provide a significant down payment toward achieving the important goal of putting the Illinois pension system on a more sustainable path. Finally, policymakers should remember that the best course of action is to grow the private sector, boosting income and employment. Policymakers must pursue pro-growth economic policies – such as lower regulations, lower taxes and secure property rights – that will promote economic development by allowing private-sector businesses to better compensate and hire additional employees. Such policies are a win-win for the private and public sectors. The employment and compensation data used in this study are from the Bureau of Economic Analysis’ Regional Economic Accounts. All calculations were performed by the authors. The data exclude farm and proprietorship income, as well as dividends, interest, rents and personal current transfer receipts. The data were adjusted for inflation using the GDP deflator. Calculating State Government Compensation Ratios: All data are from the Bureau of Economic Analysis, Regional Economic Accounts, “State Annual Personal Income” interactive database, which is available at bea.gov. To derive total supplemental benefits for any industry, find the industry line in Table SA05N (Personal Income by Major Source and Earnings by NAICS Industry) and subtract the same industry line from Table SA07N (“Wage and Salary Disbursements by NAICS Industry”). Average private-sector compensation is derived by adding “private wage and salary disbursements” (see table SA07N) and “supplements to wages and salaries” (see table SA05N), then dividing by private sector employment. Total supplemental income for private sector employees can also be derived by taking “private earnings” (see table SA05N) and subtracting “private wage and salary disbursements” (see table SA07N) and “nonfarm proprietors income” (see table SA05N). State-government employment is from Table SA25. Number of state-government jobs per 100 was calculated by dividing total state-government employment by total private-sector employment. Compensation ratios are created by dividing the average state-government compensation by job by the average private-sector compensation per job. Benefit ratios for state-government employees are created by first subtracting state “wage and salary disbursements by NAICS industry” (see table SA07N) from “personal income by major source and earnings by NAICS industry” (see table SA05N) to derive total supplemental benefits for state personnel. Next, this remainder is divided by total state-government employment to obtain average public-sector benefits. The same is done with private-sector employees (see table SA05N), to obtain average private-sector benefits. Finally, public-sector benefits are divided by private-sector benefits to obtain a public-sector employee benefit ratio. The data for wages and salaries by government function are from the Annual Survey of Public Employment & Payroll published by the U.S. Census Bureau. The data can be found here: census.gov//govs/apes/. The definitions for the government functions were taken from the 2006 Classification Manual found here: www2.census.gov/govs/pubs/classification/2006_classification_manual.pdf. The payroll data in this survey, while providing more details by government function, are also limited in their temporal scope. The payroll data are derived from one month’s earnings in March. This study extrapolates it to a year by multiplying by 12. However, the extrapolation is subject to biases due to differences in payroll in the other non-surveyed months. Generally, these data show smaller payrolls than the more comprehensive measure from the Bureau of Economic Analysis. As such, the results derived from this survey are applied to the findings using the BEA data for purposes of consistency and comprehensiveness. The agencies were matched as closely as possible to the government functions as defined by the Census Bureau. See Table 6. Then a ratio was applied based on the headcount attributed to the general funds as a percent of the total headcount. For example, the estimated payroll for financial administration is 88.6 percent paid through the general funds. To bring the data more up to date, the amounts were multiplied by the change in the headcount from fiscal year 2013 to fiscal year 2015. For financial administration, the change in the headcount was only 0.2 percent. Overall, due to the aggregated nature of the agency data used to construct these estimates, the general funds estimates should be viewed as a guidepost and actual savings could be higher or lower depending on how well the agency data actually match up to the survey’s government function definitions.